According to ADA Hurlbert’s statement; DA May guilty of Official Misconduct? 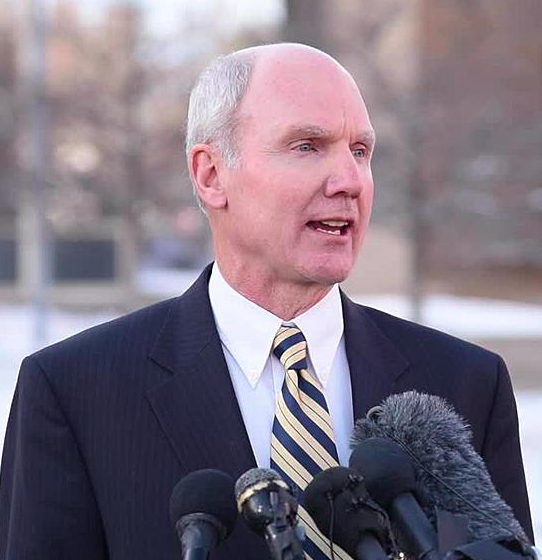 According to a source, in a recent court hearing Assistant District Attorney (ADA) Mark Hurlbert was quoted as saying; “Putting people on the Brady list after they resign is illegal”. This is an interesting statement so we followed up on this allegation and found that a KRDO story actually references this statement. Read KRDO story. ADA Hurlbert was the Prosecutor addressing the court during the hearing so this confirms our source. ADA Hurlbert, clearly, and in open court said it is illegal to put someone on the Brady list after they resign. He did not say “sometimes” or “should be”; he said “is illegal”. There is no doubt in his statement; it was heard by many people in the courtroom, to include the KRDO reporter who felt it important enough to put in her story. To provide some background. The “Brady” list was mandated based on a supreme court ruling. Brady v Maryland. The “Brady” list is a formal document maintained by local District Attorney’s (DA) offices and provided to defense attorneys. 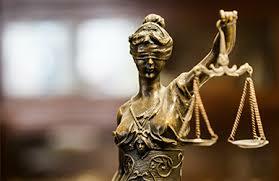 It provides the names of individuals who are currently in law enforcement and have been convicted of crimes and/or shown to have departed from the truth. Local law enforcement provide input, but it is solely the responsible and the decision of local District Attorneys who goes on the list. 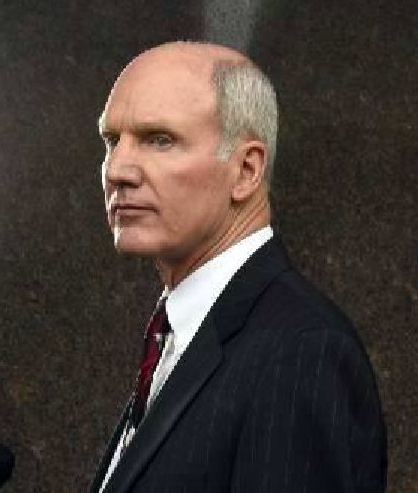 So, in El Paso County it is the responsibility of our local District Attorney; DA Dan May. Why is this a concern and why should we care? 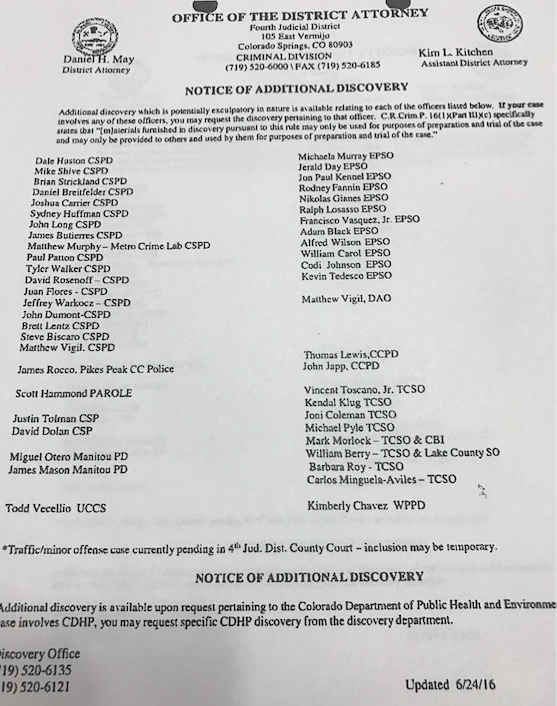 Because DA Dan May added multiple names to the “Brady” list of individuals who had already resigned; the exact same thing ADA Hurlbert said in court was a crime in the state of Colorado. Maybe it was a mistake or there was some confusion about the exact dates these individuals resigned? 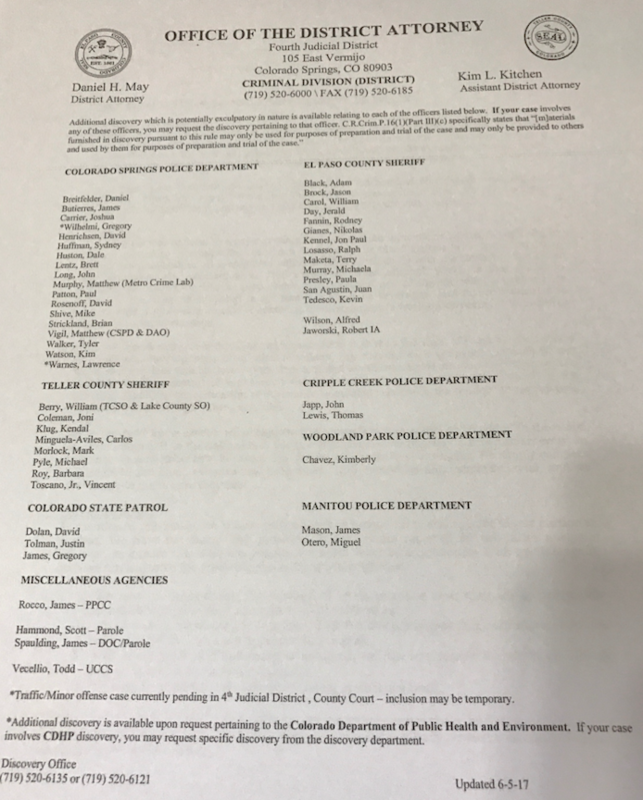 Dan May did not add these names to the list around the dates they left law enforcement; it was over 18 months after they resigned. There was no question they had been out of law enforcement for an extended period of time. Why would Dan May do this? Was it a form of retaliation against these people? Juan “John” San Agustin resigned from the El Paso County Sheriff’s Office (EPSO) in early October of 2014. Terry Maketa and Paula Presley retired in January of 2015. These are known facts; not debatable by anyone. 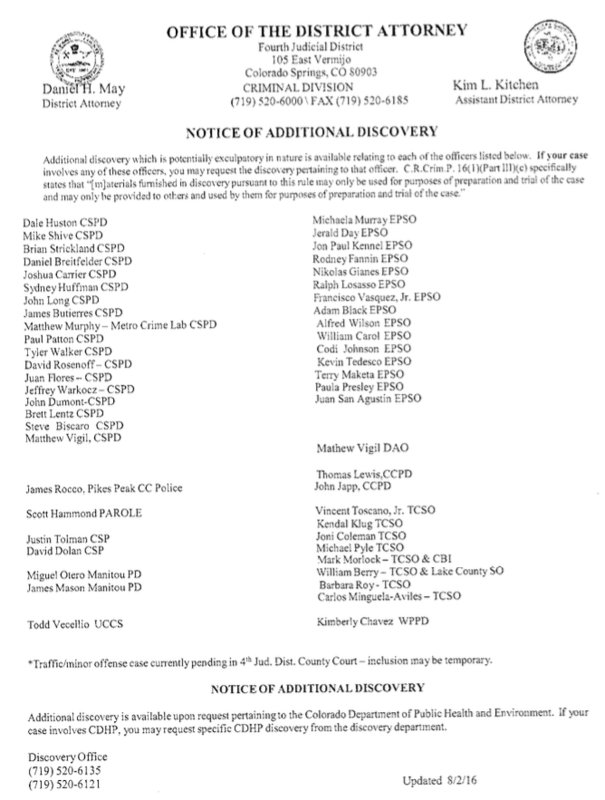 The “Brady” list is a public document updated by our local DA’s office on a regular basis. So, all we have to do is review the documents. In June of 2016; none of these names were on the list. In August of 2016 these three names appear. The names are still on the current list as of June 2017. The date of the documents are clearly shown at the bottom right corner. Here are the actual documents; June 2016, August 2016, and June 2017. DA Dan May, who is solely responsible for adding names to the list, added three names 18 months after they resigned. According to ADA Mark Hurlbert’s statement in open court that is a crime. 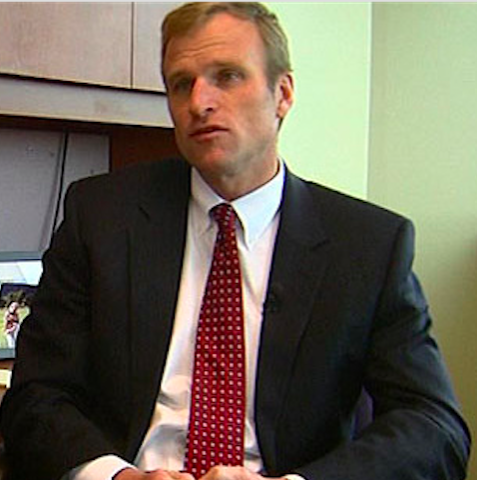 The evidence we have provided is overwhelming; (1) according to ADA Hurlbert, it is illegal to add names to the Brady list after a person has resigned, (2) DA Dan May is responsible for adding names to the list, (3) Multiple names (there are more than the 3 provided) were added long after they resigned from law enforcement. If the law in El Paso County is equally enforced can we expect Dan May (and possibly others) to be charged with “official misconduct”? Only one of two things can be true; either our District Attorney, Dan May, committed a crime; or ADA Mark Hurlbert made a false statement in court. Did Dan May, as a political payback, conspire with Sheriff Bill Elder adding these names? Who all was part of the decision to add these names to the Brady list? There needs to be an independent investigation. We believe Dan May owes our community an explanation. If ADA Mark Hurlbert stands behind his statement should he convene a Grand Jury concerning Dan May’s actions? Should an independent prosecutor be appointed to investigate?